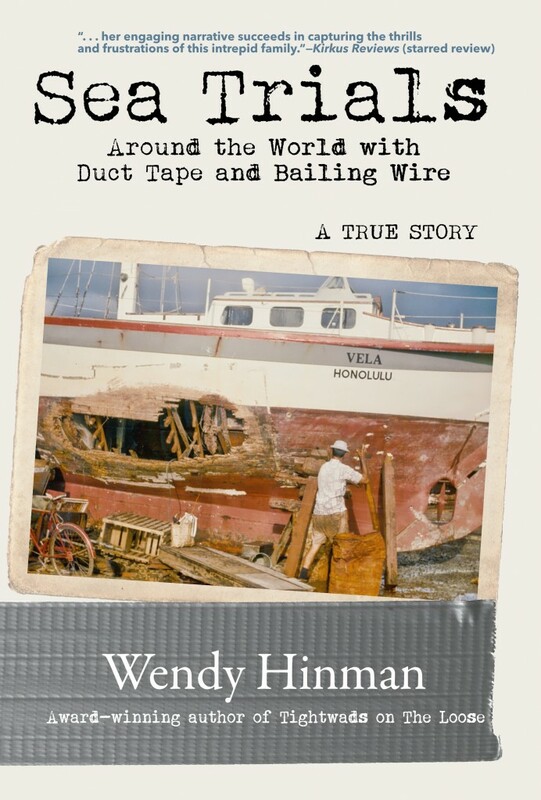 “Wendy Hinman is an adventurer, sailor and storyteller. She grew up immersed in adventure from an early age, when her father’s job as a dentist in the Navy took her family to various places during her childhood. She learned to sail and embraced the freedom that it offered. Later Hinman and her husband spent many years on their sailboat, but this book is not that story. Sea Trials is the true story of her husband’s family and their adventure cruising in the 1970s, when GPS and cell phones were not available and a family going cruising for five years was unique enough to garner media attention in many corners of the globe. Using these news articles along with detailed ship’s loge and other notes and records, Hinman retells her in-laws’ anecdotes in a beautiful tale of sailing, adventure and growing up in a close family on a 40-foot Maine Pinky. Vela, the Wilcox family’s home for what was supposed to be five years, shipwrecked just 13 months after striking out on the adventure. With two teenagers onboard, finding the strength to overcome both physical and emotional challenges became the elder Wilcox’s primary responsibility. With the damage to Vela on the reef, engine troubles and lack of communications just added to the list of problems. While there are many narratives of life at sea, few are told with such authority and grace. Since the author was not present for the adventure, she relies on a number of sources and points of view, weaving the details together in a patchwork that is richly multifaceted. The saga of the Wilcox clan is set against the backdrop of a dangerous and fulfilling time at sea, while encompassing the everyday life of a tight family at the same time. Struggles over finding landfall in the dark and fixing damaged rigging are on equal footing with squabbles over chores between the teenagers. Rose-colored glasses are not a part of Hinman’s repertoire, as the physical and emotional strain are evident throughout the book, especially from the mother’s point of view. 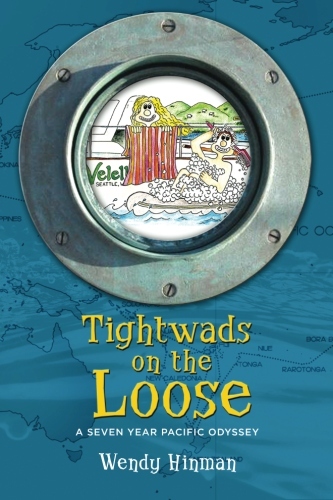 Tasked with keeping children comfortable and safe at sea, her sheer exhaustion and concern for their well-being is palpable in some pages. Hinman’s future husband, a teenaged Garth Wilcox, is the hero of the story. 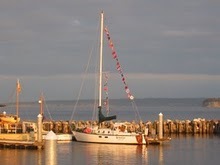 The years spent sailing with his family were not his last, and he has racked up many sea miles sailing with his wife. It is easy to see why she was attracted to a sailor who embraces the obstacles that sailing provides and uses them as a springboard to overcome other challenges. 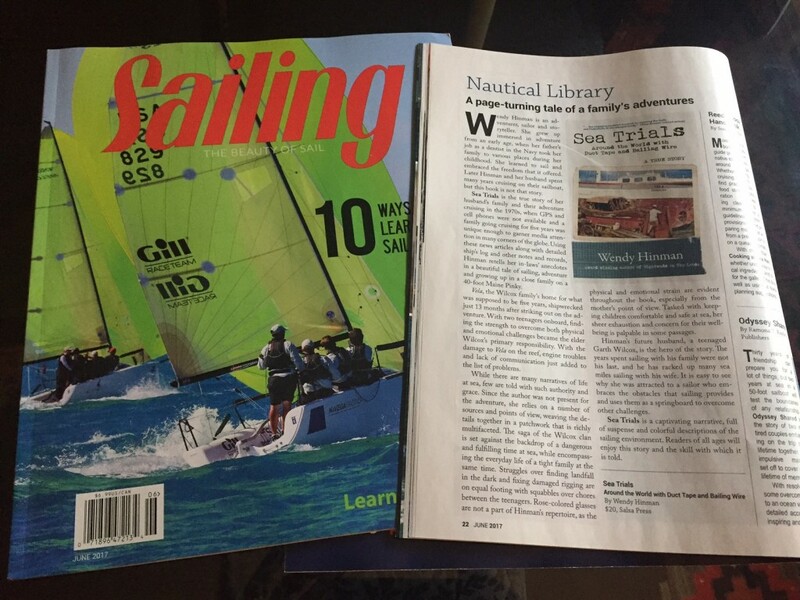 This entry was posted in Boating, Reviews, Uncategorized. Bookmark the permalink.